ABT continues its evolution into a home-grown company with fewer and fewer international guest artists, and lots of talented young dancers who’ve come up through the ranks. In the two shows I caught during the brief 2017 fall Koch season, there were some memorable appearances by dancers I’ve watched for years, but who are now being given, and seizing, the spotlight. It was also the first season in memory when Marcelo Gomes did not perform; he is on tour with The Red Shoes, by Matthew Bourne, although the ABT season did include David Hallberg, who I managed to miss. One notable revelation was the casting of Roman Zhurbin with Hee Seo in Elegy Pas de Deux, by Liam Scarlett. Zhurbin, a soloist, has long been the go-to guy for berobed male power-character roles, such as paternal or kingly figures, the monster version of Von Rothbart in Swan Lake, etc. Here, he bares his usually covered muscular torso, and is allowed to simply dance. While that involves lots and lots of lifts and overhead presses of his Seo, it was a revelation to see his confident, sensitive performance purely as a dancer. The standing ovation he received shows that others felt the same way. Seo has proved remarkably diverse as a dancer, too, although she excels in abstract roles rather than dramatic ones. Her line is always perfect and elongated. Gillian Murphy has become perhaps the most reliable and versatile female principal. I saw her featured in Robbins’ Other Dances, a duet with Cory Stearns; both were superbly nuanced and tender in this romantic work. And as the lead in Her Notes, Jessica Lang’s 2016 ode to Fanny Mendelssohn, she was paired with Thomas Forster and articulated each pose perfectly. Forster was also cast in numerous highly visible roles, including Ratmansky’s Serenade after Plato’s Symposium and Wheeldon’s Thirteen Diversions. While Forster has been steadily rising through the ranks (he is a soloist), his strengths have been his shapely feet and his height, but he has been filling into his tall frame and has developed his partnering. Christine Shevchenko and Calvin Royal III in Songs of Bukovina. Photo: Marty Sohl. Newish principals Stella Abrera, Misty Copeland, and Christine Shevchenko have taken on their fair share of lead roles, with great success. 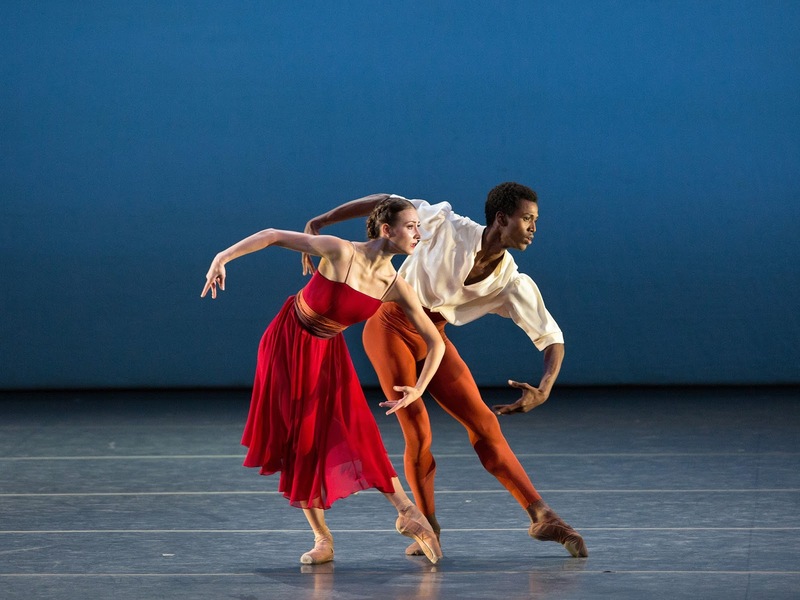 Shevchenko led Songs of Bukovina, the Ratmansky season premiere, dancing with Calvin Royal III. I still have yet to get a full sense of her style, but she is so fundamentally sound technically, and clean of line, that no doubt many her assured future roles will bring that into focus. Royal, now a soloist, has such gentle confidence and fluidity, and is given to heartfelt smiles now and then. The two were also matched in Symphonic Variations, a fascinating 1946 Ashton opus on form, line and detail. Soloist Joseph Gorak was born to dance such works by Ashton, and he shone in a repeat role in Plato’s Symposium as well. Another outstanding performance in that work was given by Tyler Maloney, a corps member; he acquitted himself wonderfully in Bukovina as well. Other corps dancers caught the eye. Gabe Stone Shayer's exuberant personality and love of dancing distinguish him in everything, which included Bukovina and Her Notes paired with Misty Copeland. Catherine Hurlin has shown great range for a youngster, with remarkable polish and magnetism. Zhiyao Zhang danced with clarity and vim in both Plato’s Symposium, and subbing for Alex Hammoudi in Thirteen Diversions. Ratmansky produced Songs of Bukovina for the 2017 fall season, to live piano music by his frequent collaborator, composer Leonid Desyatnikov. It is a perfectly pleasant way to spend a half hour or so, if not breaking new turf for the prolific Russian choreographer. After a section of divertissements by the four couples, one pair is featured—Shevchenko and Royal, who acts as a sort of emcee, gesturing to individual dancers to begin their solos and duets. Dynamics range from allegro, skipping and darting, barely touching the stage, to grand gestures such as pirouettes with the leg in second. Details such as wagging heads and flexed feet feel somewhat disconnected to the primary movement. But it’s a decent vehicle for 10 dancers, and with just one pianist needed to produce the music, it’s sure to be included in future seasons. Ratmansky has thus far spoiled us with one dance after another, producing such gems as Plato’s Symposium. But it would be wise to remember that even Balanchine couldn’t produce a creative breakthrough every time. We are thankful for every dance we get from Ratmansky.